prior to adoption, surgery, prescription diets, diagnostic testing, and vet tech/vet staffing expenses. While the Veterinary Care Fund covers expenses related to routine vet care, it also pays for expenses related to the care of animals needing more specialized care, including injured and newborn animals. Please enjoy these animal stories from some of the recent beneficiaries of the Vet Care Fund. Thanks to support from donors like you, all of these animals received the care they needed and have been adopted. Daphne was diagnosed with a Grade 3/6 Heart Murmur during her routine exam. Further diagnostic tests revealed a good prognosis with no apparent cardiac disease. Joyfully, she was adopted by her foster mom and is doing well! Lola was having trouble urinating and when she did, it was often mixed with blood. After several x-rays, exams, blood work, and urinalysis tests, she had surgery to remove multiple bladder stones. She needed antibiotics and will need to be on prescription food for life. But she is finally living pain free! In late summer of 2017, we experienced an influx of orphaned or newborn kittens and pregnant mama cats. Supporters like you answered the call for help and we were able to provide them with all of the necessary routine and special vet care needed before finding them loving homes! Maggie was surrendered to us when her owner fell ill and entered long-term care. She's sweet and playful but needs a dental cleaning. Because Maggie also has a heart murmur, sedation should be avoided. Maggie is scheduled for a non-sedated dental appointment on Sept. 13, 2017. Trick arrived in our care with an obvious limp. Somewhere along the line, he had suffered a traumatic injury that left him needing a Femoral Head Osteotomy (FHO) surgery. Thankfully, his recovery was very smooth and today, Trick enjoys spending time with his new family, pain free! Tiki was found on the side of the road in rural Georgia and transported into our care. Tiki had heart complications as a result of a previous Heartworm infection. Her breathing was labored and slow. She was in our care for several months, receiving breathing treatments and medicine. We are happy to say that she made a full recovery! Like all senior cats in our care, Bass needed a little extra veterinary care in the form of a CBC and Chemistry blood screening. This extra step is taken with all of the senior cats as a way to confirm their health and identify any possible underlying medical issues needing attention. Even at 14 years old, Bass was very healthy and soon adopted along with his best friend, Guinness. 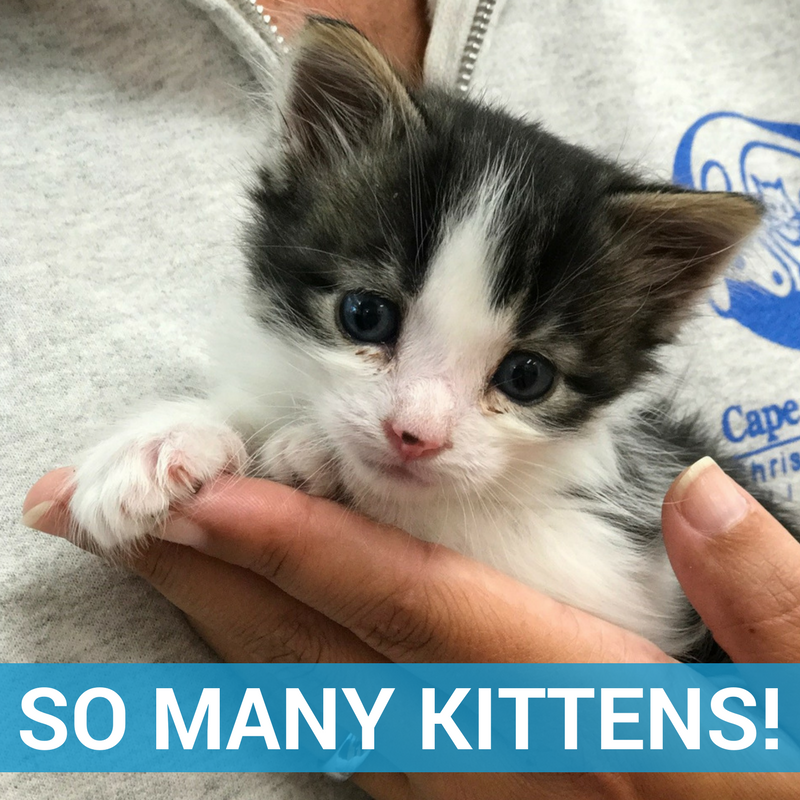 When a box of kittens was found on the doorstep of a local vet, Cape Ann Animal Aid was called to help. These kittens needed extra supportive care to grow healthy including probiotics and a special diet. All were spayed/neutered and have found loving homes.